1. Montgomery voter turnout in the November election was the highest in Franklin County. What percent was it? 2. Richford was the lowest. What percentage was it? 3. Other than being Republicans and having fathers born outside the U.S., what is a political connection between Vermont's Chester Arthur and Republican Nominee Mitt Romney? 4. President Obama won the 2012 vote in Vermont. Where did Vermont rank in terms of percent compared to the other 50 states? As a trained intelligence officer it's bad form to admit any degree of surprise. While I was pretty sure something was up early on (too much whispering during the fall Board meetings? ), I thought efforts on my behalf for this year's VHS League of Local Historical Societies (LLHS) Annual Meeting were over since I would be out of state during that time. 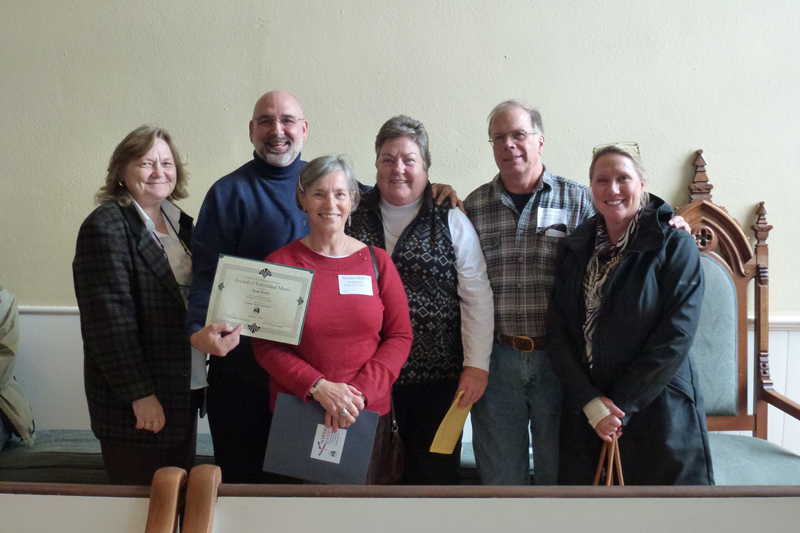 Imagine my surprise in Illinois when I learned I had been nominated by the Board, and had won, an Award of Merit. Even more, the Board's conspiracy extended to my wife, Sharon (another Intelligence Officer), to get me back in time for the meeting in Woodstock. I want you all to know that I was honored by the Board's efforts on my behalf. I feel blessed to have them working with me for what I'm sure is a shared labor of love. We've won 9 of these awards since 2007. All of our honors and successes are tributes to our teamwork, and our membership's and community's support. I am never surprised by our accomplishments. Don't keep them a secret. at the Annual Meeting of the VHS League of Local Historical Societies. We've hit our goal once again with over 217 memberships totaling over $11,000 in donations. Our thanks to all of you who have joined or renewed. There is always room for more, so tell your friends and invite them to join us. 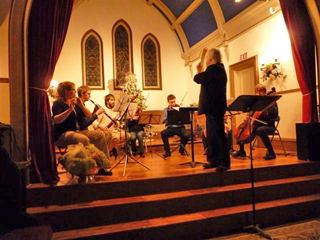 Pratt Hall hosted another Community of Expressive Artists meeting in November. 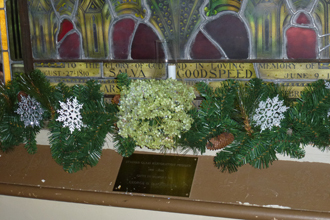 We received a nice thank you note for the use of the Hall and the wonderful decorations. We deferred to the Conservation Commission and didn't publish a calendar this year. We are gathering material and will do a second edition of "Then and Now" for 2014. The Conservation Commission is still selling them so get yours now. 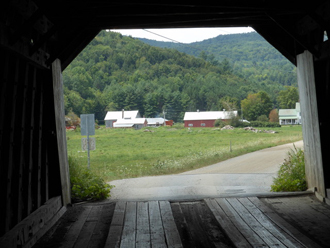 Last newsletter we reported the Vermont U.S. Congressional delegation announced an $850,000 grant from the Federal National Historic Covered Bridge Preservation program for the Longley Covered Bridge. This grant requires an additional match, of which the Town's share is normally no more than 5%. While the State normally manages the project the Town has input along the way. On November 27th, a team comprised of Scott Perry (Selectboard and Society Chair), Selectwoman Carol McGregor, Sean James from Hoyle, Tanner & Assoc., Bethany Remmers from Northwest Regional Planning, and consultant Jan Lewandoski met with the State Historic Covered Bridge Committee (HCBC) to vet five possible alternatives. The Town would like to repair and restore the bridge but increase its load bearing capability since the damages to the present structure are clearly related to chronic overloading. The HCBC approved two alternatives along those lines. The first would incorporate laminated beams (glulams) in the underside of the bridge, and rehab the existing trusses, probably replacing about 60% of the truss timbers. The second would involve rebuilding the floor and truss using new, bigger/stronger timbers. Both options would reuse the roof system and replicate the Town Lattice design used by the Jewett brothers, what is called Preservation of Design. The Selectboard hosted a public information meeting in December. It prefers the second alternative because it will achieve higher load capacities, and this alternative was endorsed by those present. Engineering work could begin soon, but actual start of construction is estimated in 2015. The lone, large maple tree remaining on the Village Common was in danger of splitting and blowing down so Master Gardener Carol McGregor, aka the Tree Warden, and Barry East, VT Tree Steward in training, won a Community Foundation of Vermont grant, to have preventative work done on the tree. 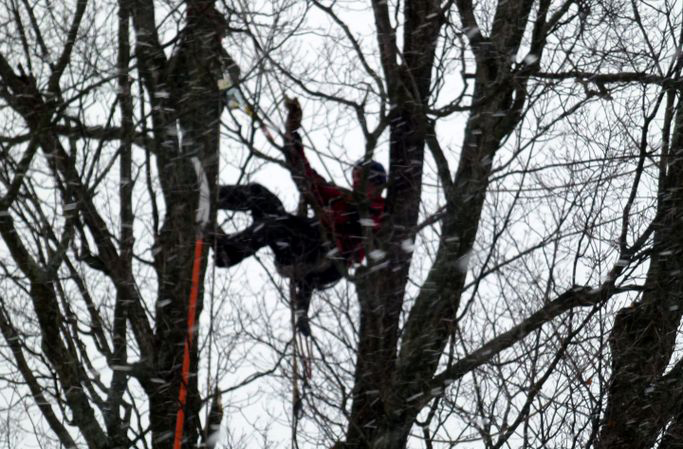 Gregg and Jake Campbell from Richford, DBA Franklin Forests Inc., were hired to cable the branches high up in the tree, to help balance it and to remove some dead branches. The Covered Bridges Garden Club and the Montgomery Historical Society helped support this effort. The work was done on Dec 15th and 22nd. The tree was probably a sapling when Pratt Hall was renovated after the Civil War. Marijke Dollois passed on this link to Bob Soden's Jay Peak History website. http://www.jaypeakhistory.com/index.php It documents all the work done to develop this area including roads in the nearby communities. Route 242 from Montgomery was built without State funding and with tons of donated time, materials and equipment. It's a great read and makes you appreciate how a relatively small group, dedicated to a vision, can get seemingly impossible things done. 1. d. 72%. Montgomery had the 90th highest turnout of the State's 275 voting precincts (roughly one precinct per town). Franklin County turn out was 63% and ended up in a three way tie for last of Vermont's 14 counties. Source: Vt Sec. of State. We've received word that the TD Bank Affinity Program will be changed. Our next award, which we normally receive in June, will be capped at 75% of our last payment, about $7,300. One tenth of one percent of the average balance in each account for the year. Eligible accounts include business checking, and consumer checking, savings, Money Market, CDs, and Retirement. Average account balances must have been maintained or grown each year. We may need you to re-designate us as your Affinity partner, or re-enroll, after June. We will know more later and will send out instructions. Your continued TD Bank patronage and designation of the MHS as your Affinity Program partner are greatly appreciated. Thank you. 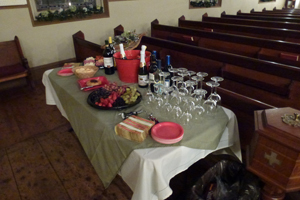 Our annual Member's Christmas Social drew an enthusiastic group who enjoyed an assortment of wine, cheeses and fruit. We could have used some snow to help us get in the mood. Thanks to Sue Wilson for pulling the gathering together. 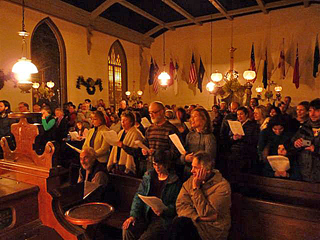 Candles and Carols, our community sing along, just keeps getting better and better. Thanks to Maestro Andrew Massey for arranging and leading an impressive group of young musicians, and an enthusiastic audience of carolers, all filling Pratt Hall with music and cheer on December 23rd. 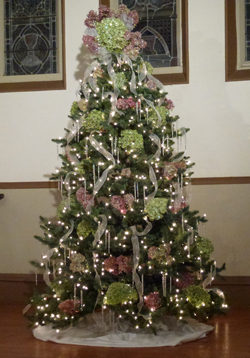 Peg Doheny, Rita Kalsmith, Sue Rusk, and Michelle Legault supplied Noela McGroarty with the Hydrangeas which she turned into stunning ornaments and decorations and which she and Marijke Dollois used to adorn the hall. Thanks also to story tellers Christa Chevalier and Lisa Perry, and to Sally Newton and Marijke Dollois for organizing and providing refreshments, and to Sharon Perry for the fudge and other sweets. Appreciation to the Black Lantern as well for providing a haven for our musicians and their families before the show. It was a magical, cold and snowy night; many stopped and took pictures outside as they left. T'was a classic Montgomery white Christmas scene to herald the season. February 1927 - Car hit by train in Sampsonville (Enosburg) killing one man from Montgomery and injuring two. March 1895 - Montgomery votes to establish a Library.